Last week, I was working as the chef at Jackie Beaudoin's cottage yoga retreat. I love these kind of cooking gigs. They are a great opportunity for me to showcase some of my favourite healthy foods to very receptive and open-minded groups of people. Typically everything I make is vegan, gluten free, super healthy, but also loaded with flavour. I also make a concerted effort to feature as many seasonal and local vegetables as possible. During the weekend, we ate lots of root vegetables and squash. I also conjured up a great new recipe featuring one of my fall favourites: pumpkin! 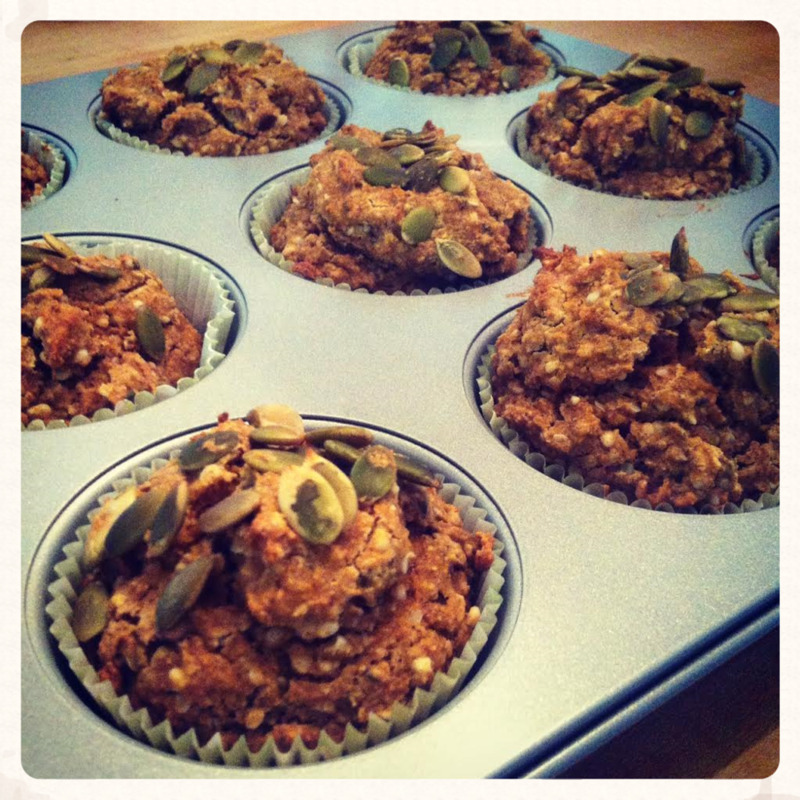 Below, you'll find the recipe for my oat & hemp pumpkin spice muffins. The base for these is oat flour. Lately, it's been my go-to for baking. I like that it has a bit more fibre than most flours and that I can easily make it myself. If you have a high powered blender or a good food processor at home, you can too! Simply place rolled oats in a blender or food processor and process until they are finely ground (flour consistency). I'm also a big fan of hemp hearts. Most people don't realize this, but hemp hearts are grown exclusively in Canada. They are also great source of protein, vitamins, minerals and fibre. They add a nice nutty flavour to the muffins. As for the pumpkin purée, the canned version works, but it's very easy to make your own. Use one small pie pumpkin, cut it in half and remove the seeds (put them aside and you can roast them later for a healthy snack). Rub a little bit of coconut oil on to the inner pieces before placing the halves (skin side up) on a parchment-lined cookie sheet, then bake for 30 minutes at 400°. Honestly, there's nothing quite like the taste of roasted pumpkin. It's so good! If you have the time, and a pie pumpkin, I recommend this method. Given that it's Halloween weekend, this recipe is very timely. If you're trying to stay away from candy, but still hoping to satisfy your sweet tooth, I've got you covered! Preheat oven to 350°F. In a large bowl, combine the dry ingredients, sifting or whisking in the baking powder and baking soda. Stir through until well combined. In another bowl, combine pumpkin purée, coconut oil, maple syrup, non-dairy milk, vanilla, and dates and mix together. Add the wet mixture to the dry mixture, and gently fold and mix through, until well combined (but do not overmix). Spoon the mixture into a muffin pan lined with cupcake liners (this will fill 12 muffins quite full). Top with pumpkin seeds. Bake for 21-23 minutes, or until a toothpick inserted in the center comes out clean. Allow them cool completely before trying to remove them from the muffin tray, or they may fall apart.